Lost in the Wilderness. It can happen to the best in their job. Sometimes one small step can cause a trouble, even if our intention isn’t like that. And than, it is important to find the best way to solve the situation as soon as possible. Going somewhere deeply in the nature, on mountain or some forest, in a jungle or elsewhere means to accept having some risk of danger. And you need good guides with you wherever you go. If you are not ready to do something, than ask a friend who is. Billy and Julia are guides of a group of campers in one of the wildest areas in the country. This was supposed to be one routine camping, but Billy and Julia for the first time in careers have made a mistake in the space orientation and now they are lost. Now it is necessarily that all of them will find the way how to go out of that wilderness. Here you come on board, our dear friend. Put yourself in a similar situation and how much you would need a help. You might learn something from the game and that might help you some day when you find yourself in a similar situation. 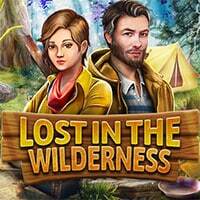 Lost in the Wilderness is a free online hidden object game on Hidden4Fun.